Back in the Milkweed Patch. Monarchs arrived early this year on the Knobs, in southeastern West Virginia. I spotted a tattered, faded monarch—likely a Mexican migrant— on April 30. Between those she left and those I found checking out milkweed on other spots on the Knobs, I found over 75 eggs. The weather shifted between unusually hot days, 90° or more to cold wet days. monarchs generally do. Most of the chrysalides eclosed June 9th, 10th and 11th, giving me a wonderful gift for my 60th birthday. 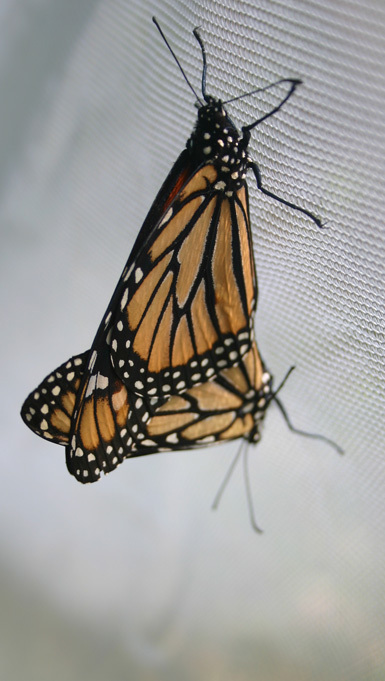 I kept them in a screen tent in the yard for a few days so that they would mate and be ready to lay eggs as they continued their northward migration. I wanted a few eggs to be left on the Knobs. Once most of the butterflies had mated, I released them to continue their migration north. They left me around 100 eggs in the tent which I am currently raising. I am a naturalist, illustrator/author and educator who has been raising and releasing monarch butterflies for over 40 years. This entry was posted in Migration north, Monarch butterfly life cycle, Monarch migration, Monarchs on the Knobs, Raising monarchs and tagged monarch butterflies, monarch migration, monarch monitoring, Monarchs. Bookmark the permalink. Bas Relief, LLC Books, Educational Supplies and Artwork Celebrating Natural History (especially monarchs!) Bas Relief, LLC is the work of Ba Rea, exploring natural history. It includes books, educational materials, writing, and artwork. The subject matter often focuses on monarch butterflies and the milkweed community. 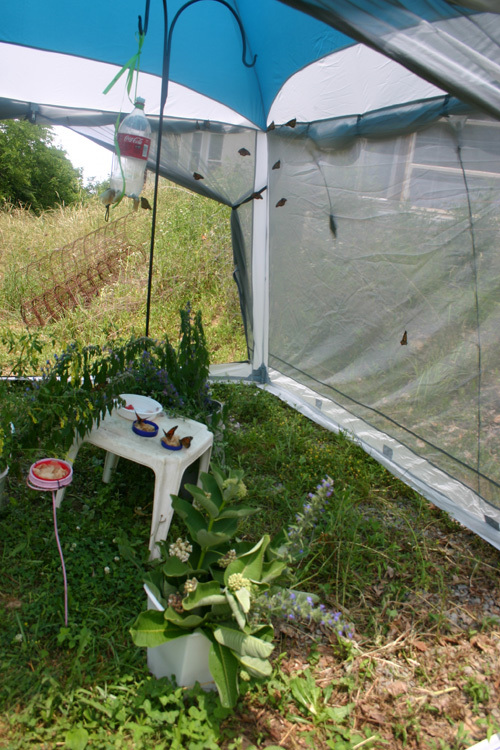 Edith Smith's (of Shady Oak Farm) Wednesday, January 21, 2009, Blog page "What is Going On Inside a Monarch Chrysalis?" Edith Smith presents a great labelled image of the body parts visible on a newly formed monarch chrysalis. Journey North's Monarch pages An excellent resource for monarch information where students and monarch enthusiasts track monarch migration. Monarch Watch Monarch Watch at the University of Kansas offers tagging, Monarch Waystations programs and more. The Monarch Larva Monitoring Project A great citizen science project investigating the population dynamics of the monarch butterfly. You can be involved. Ba Rea, exploring the nature world.